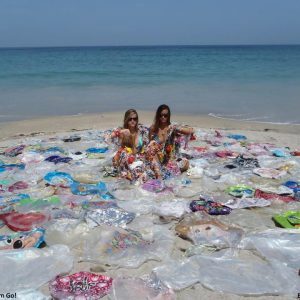 Intensity of beach oiling plus our monitoring beaches. As the clean-up progresses, so does our monitoring. We now have sampled an array of sites that span the region of potential impact (Gaviota to downtown Santa Barbara) and the range of observed intensity of oiling. 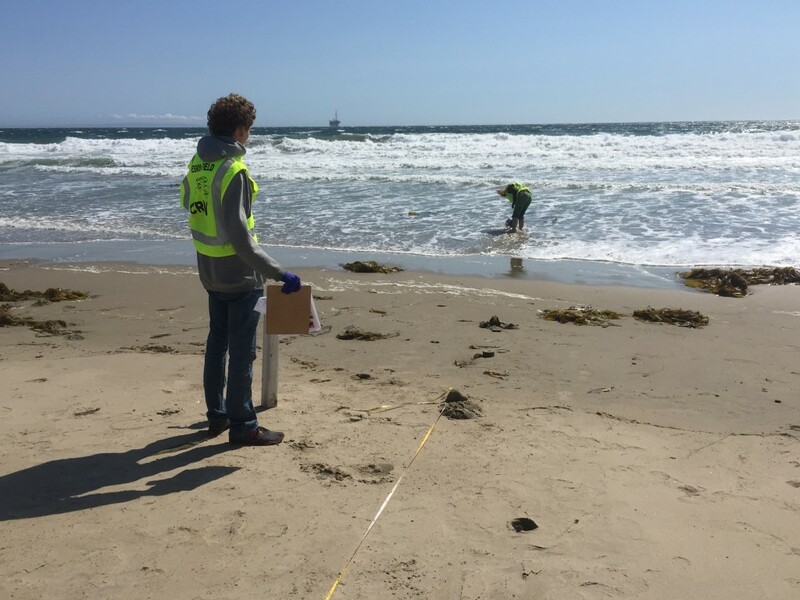 We are now beginning to shift gears a bit to have some of our crew focus on our other assessment efforts (beach visitation rates, our robotic data collection assessment tools, etc.). Light oiling at Bacara Beach on May 26, 2105. 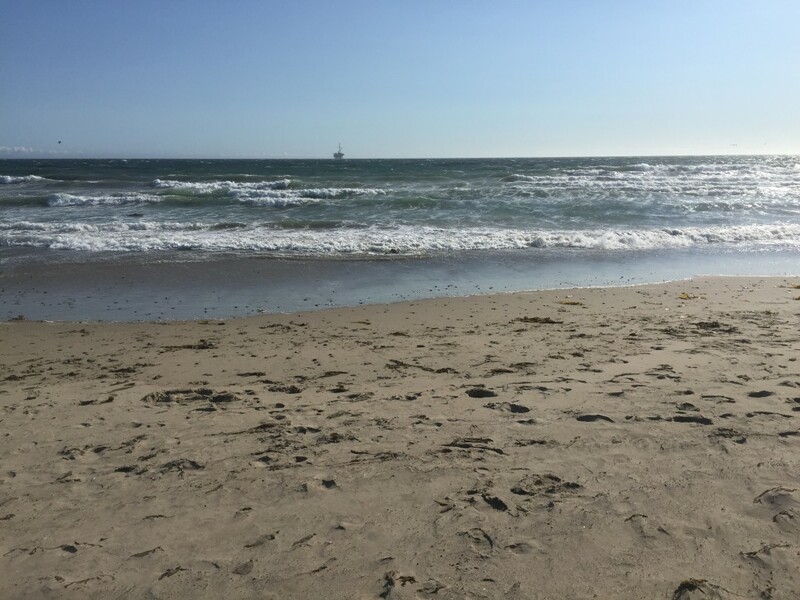 Confirming our initial observations from the very beginning of this spill, much of the oiling and obvious impact has been concentrated in and around Refugio State Beach. Today Unified Command reported 7.4 km (4.6 mi) of beach have been heavily oiled (red in the above map) and 14.3 km (8.9 mi) of beach lightly oiled (orange, yellow, and green in the above map). Our table below lists the data available from Unified Command as of the Wednesday. We have observed a small amount of dead fish, an unusual concentration of dead sand crabs (Emerita analog) at some sites, and a handful of oiled brown pelicans (Pelecanus occidentalis, which may or may not be included in the reported totals below) over the past week. 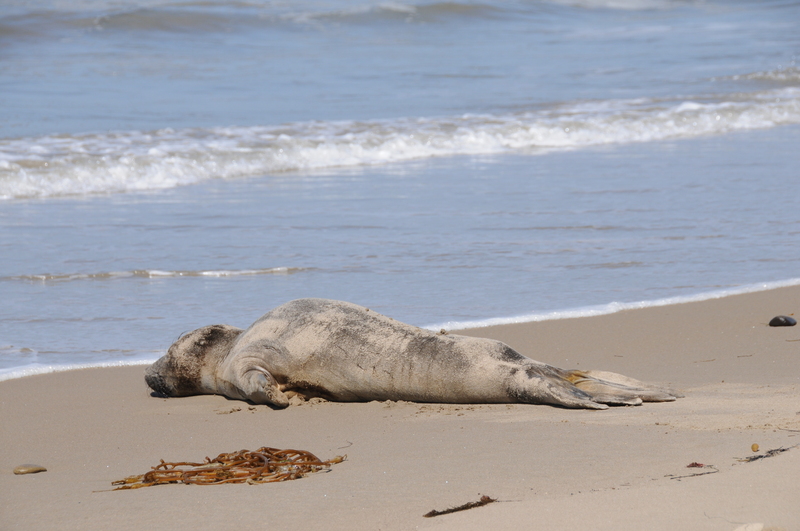 Most of the marine mammals recovered to date have been California sea lions (Zalophus californianus) and northern elephant seals (Mirounga angustirostris), generally in poor condition independent of the spill/oiling. Most of the oiled birds have been brown pelicans. Northern elephant seal juvenile at El Capitan State Beach on the morning of May 20, 2015 prior to the first oil arriving to this beach. 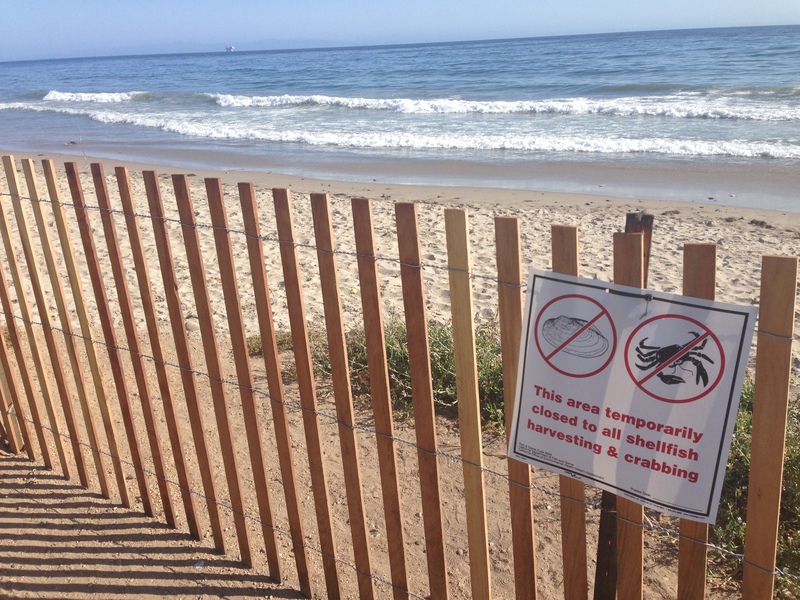 Bacara Beach fishing closure sign due to Refugio Oil Spill. A fishing closure is in effect until further notice. The aerial exclusion zone (below a 1000′ ceiling) now in effect is slated to terminate Friday, May 29. 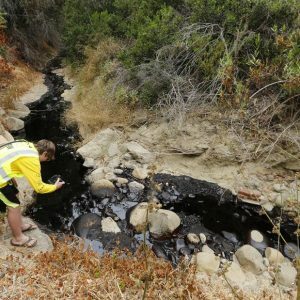 Generally we are seeing what we have expected to see prior to this oil spill occurring: a relatively depauperate and sparse infernal community. 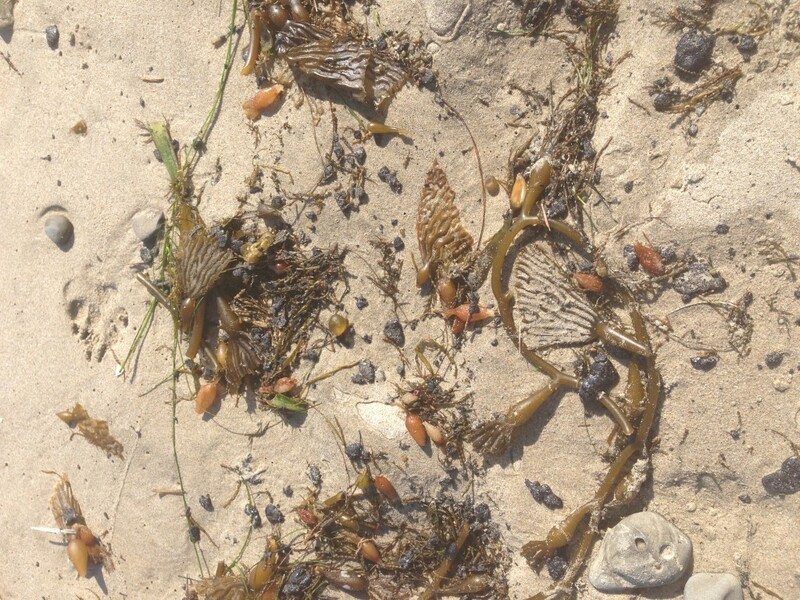 This entire year we have been finding comparatively few sand crabs and a very low density and diversity of infernal critters in the sandy beach assemblage. This highlights the value of long-term and regional monitoring efforts such as ours. Armed with such data, we can more robustly say what the impacts of oil are. 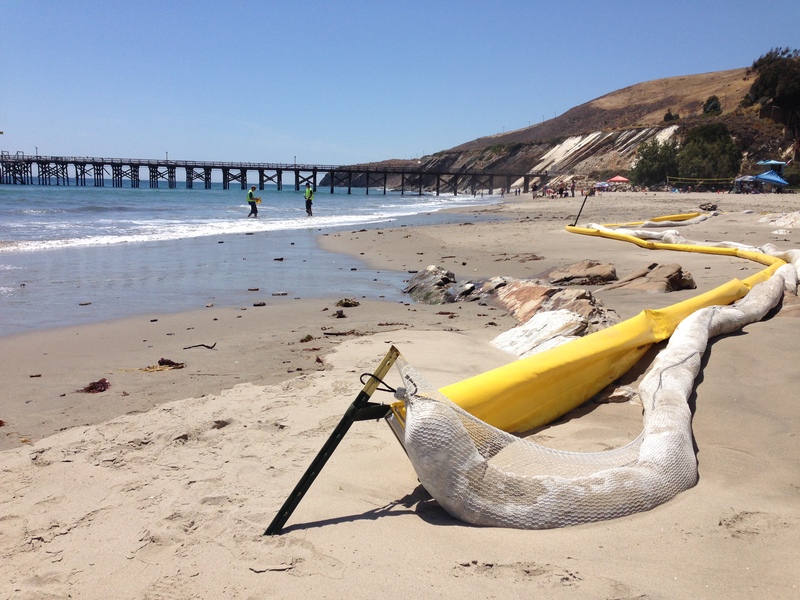 Oil exclusion boom at Gaviota State Beach on May 24, 2015. Only lightly oiled Campus Point Beach on May 22, 2015.